Apple pie muffins. Think apple pie filling meets fluffy muffin dough. Think sweet, gooey, cinnamon-coated apple slices. Think of how good the kitchen will smell after you bake a batch of these goodies. You see, I heart pie. I really really do. And I heart muffins too, so why can’t my two loves meet and create one giant love? To be fair it took me a couple tries to get these muffins right. When I received the email with this week’s Muffin Monday recipe for an Apple Muffin, my pie-loving brain instantly thought of apple pie muffins. Then I was faced with the dilemma of how exactly one shoves a pie into a muffin. My first attempt was a bit of a failure. The muffin itself had a nice texture but really lacked oomph and sweetness. On my second go around I added a normal amount of sugar for a muffin, plus the already sweetened apple pie filling. Things started heading in the right direction. After a little experimenting with apple pie filling combined with the right proportions of flour, sugar, baking soda and eggs, a little magic happened. These muffins really do taste like apple pie in muffin form. The cinnamon streusel on top adds the perfect bit of crunchy sweetness, like a Dutch apple pie. They are chock full of spicy and fragrant cinnamon and bursting with baked apple goodness, all tucked inside the body of a muffin. My two loves successfully merged into one, living happily ever after. Preheat oven to 400 degrees. Butter a 12-cup standard muffin tin; set aside. Whisk together sugar, flour, baking soda, salt, and cinnamon in a medium bowl. Whisk together eggs, buttermilk, and butter in a small bowl. Gently fold buttermilk mixture into flour mixture until just combined; do not overmix. Fold apple pie filling into the mixture until evenly incorporated. For streusel combine the sugar, cinnamon and flour and butter and work it with your finger tips till the mixture is crumbly. Top each muffin with streusel. Divide batter among muffin cups, filling each about three-quarters full. Bake until muffins are brown around edges and spring back when touched, 16 to 18 minutes. The cinnamon streusel sounds divine! These were magically moist and I absolutely loved that too! A – I love baking with buttermilk now, it does something wonderful to the muffins! Well I’m glad to hear that I wasn’t the only one who flopped at these the first time! They still tasted good, just gotta get them to look like yours next time! I’m with you on the buttermilk issue – it really does something magic to muffins! The cinnamon streusel must have been awesome on these, after all apples and cinnamon are a match made in heaven. I love your take on the recipe, I will print this off for my files to try this week. So nice to have participated with you for the first time this week too! Love the cinnamon streusel! Yummmmy! I will have to make mine with that topping next time. Happy Muffin Monday! 2 tries? Now that’s dedication! They look great! Bianca – They flopped two more times but third times a charm! Carrie- i had to I wanted them so badly after the first try I just didn’t want to give up so I basically spent my entire day baking! Kudos for baking these muffins twice 🙂 love the idea of cinnamon streusel! Cinnamon streusel! Now that makes me want to work harder at perfecting a gluten-free streusel. I think you’re right about the sugar. I only got away with not sweetening the apples because of the cinnamon chips, I think. Yuri – My belly was determined to enjoy these! Princess Polkadot – streusel is the best! 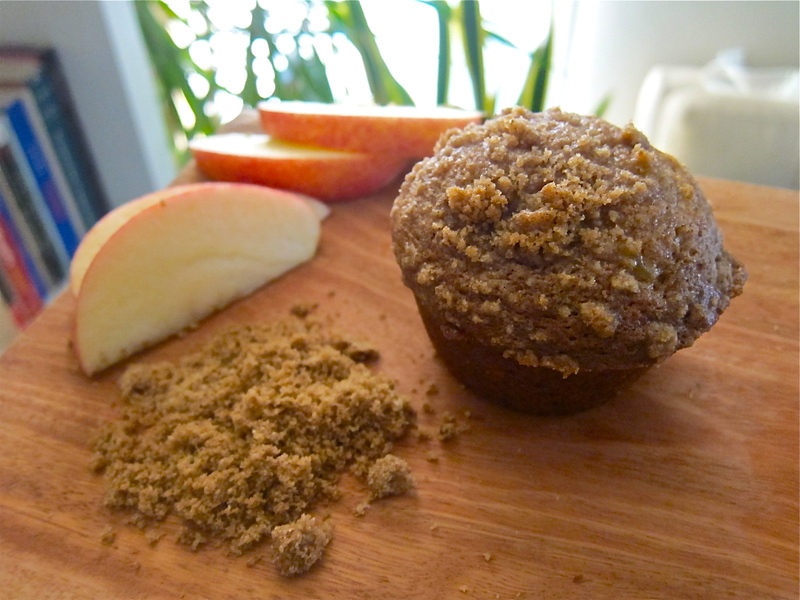 Stay At Home Chef – i really loved these muffins truely the taste of a classic apple pie in the body of a muffin! “Then I was faced with the dilemma of how exactly one shoves a pie into a muffin.” Hehehehe. I LOVE this! And I love that you found a way to combine your loves! I was wondering if the brown sugar in the muffins was packed or not; could you help me out? Melissa – itt was not packed 🙂 hope you like the muffins!